I just like Springfield Armory. They ought to stay around for the rest of my life anyway. I wonder if anyone on this forum bought one of these guns. Filing for Chapter 7 is a death knell for the company. I wonder who will pick up the pieces? That looks like a really nice, well constructed pistol. I've never heard of them. First, I actually had the same thought in a slightly less clearly defined manner, but wondering how many small gun manufacturers die on the vine for every one that becomes successful. The second thing is towards the end, when he says to never pay up front for a new "upstart" gun, I immediately thought of AndyC and his Automag .44 that's been on order now for a while. There are indications that guns will start shipping any day now, but that prepayment money was "out of circulation" for what.... 12 months or longer? Fortunately for Andy, it looks like he's going to be OK. But my guess is that the current owner(s) of Automag know some of the frustrations that the owners of Hudson faced. The new company's manufacturing plant and designs were outdated and unable to compete against the Japanese, so Bloor decided against relaunching Triumph immediately. Initially, production of the old Bonneville was continued under licence by Les Harris of Racing Spares, in Newton Abbot, Devon, to bridge the gap between the end of the old company and the start of the new company. For five years from 1983, about 14 a week were built at peak production. In the United States, owing to problems with liability insurance, the Harris Bonnevilles were never imported. Bloor set to work assembling the new Triumph, hiring several of the group's former designers to begin work on new models. The team visited Japan on a tour of its competitors' facilities and became determined to adopt Japanese manufacturing techniques and especially new-generation computer-controlled machinery. In 1985, Triumph purchased a first set of equipment to begin working, in secret, on its new prototype models. By 1987, the company had completed its first engine. In 1988, Bloor funded the building of a new factory at a 10-acre (40,000 m2) site in Hinckley, Leicestershire. The first Hinckley Triumph's were produced for the 1991 model year. Bloor put between £70 million and £100 million into the company between purchasing the brand and breaking even in 2000. Wow! £70 million and £100 million (and a £ > a $) investment AND 7 years before he began to turn a profit. Not very many people are fortunate enough to have those kind of resources. There is a similar story with Indian Motorcycles. And even Buell Motorcycles, which had the more or less good fortune to eventually be absorbed by Harley Davidson, was finally shut down. The fact is that having a great idea is not always enough. Without the manufacturing knowledge and capital to make it happen, the odds of success just aren't good. I didn't know that John Garand actually also designed the tooling to manufacture the M1, but I'm not surprised. Anyway, it's too bad that Hudson crumped. They were a big deal at the Shot Show before last. And then there's the saga of Elio Motors, which has been going on for about 6 years now. Have you seen any 3-wheeled cars on the road lately? Sure looks like it could be heavy to me, but never know. Haven't seen one yet and doubt I will with $1200 msrp price. They would have to overcome overwhelming obstacles. Chapt. 7 is liquidation as mandated by the Courts. They have no choice in the matter. In the past week Hudson Manufacturing’s bankruptcy filings became public. KE Arms LLC is listed as a creditor in these documents. As this is now in the public sphere, we feel it is now appropriate to discuss this publicly. KE Arms manufactured the bulk of the slides for Hudson H9s. 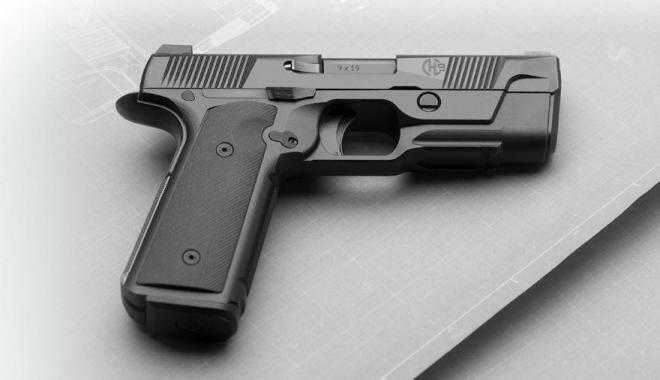 We were selected to produce these parts by Hudson because of our experience manufacturing pistol slides for a variety of OEM clients, and our ability to ramp up production. At one point we were delivering 400 H9 slides per week to Hudson Manufacturing. We also developed and prototyped the H9A frame. The last payment we received from Hudson was in July of 2018. Between delivered product, inventory on hand, and development fees we are owed in the upwards of seven figure range. We are currently exploring market demand for the slides and alloy frames (made from 7075 billet) we have on hand, and manufacturing new small parts. We want to recover our costs, and help existing owners of H9s that currently have nowhere to turn for service and support. Like those who have sent in guns months ago to Hudson for service and heard nothing back, we also have not had communication with Hudson in months. Well, that's a logical and decent way forward.